13633 and 13888 Point Lakeview Rd, Lower Lake, CA at Gregory Graham and Vigilance Wineries and Vineyards. – Wineries and tasting rooms. Our thanks to Gregory Graham Winery and Vigilance Winery and Vineyards. A serene 1.25-mile hike through vineyards in the Red Hills Appellation. Stunning views of Clear Lake, Anderson Marsh wetlands, and the north shore ridgelines. Elevation gain and loss: 187 feet. The loop begins at either Gregory Graham Winery or Vigilance Vineyards and Winery. From the parking lot at Vigilance Tasting Room farm­house (1), head up the hill toward a magnificent old barn – a vintage walnut dryer (2). Built in the last century, the structure is a solitary reminder of Lake County’s height as an agricult­ural center, best known for walnuts and pears. Just before reaching the road, head west along a row of cabernet vines. Pause to look around. Lava eruptions and flows began approximately 450,000 years ago, forming some of the ridgelines. The hills surrounding also are lava flows, part of the formation known as the Basaltic andesite of Round Top Mountain. Much younger in age; the flows started erupting roughly 125,000 years ago. This unique geologic history has created a terroir, a French term from the word terre for land, loosely trans­lated as “a sense of place.” Terroir refers to a group of vineyards from the same region, belonging to a specific appellation, and sharing the same type of soil, weather conditions, and grapes – all contributing their specific personality to the wine. Continue walking along the trail, after 1/3 of a mile you’ll come to a gate (3). Head up the hill and cross Point Lakeview Road – watch out for vehicles. The path switchbacks towards another gate (4) ; you are entering the Gregory Graham vineyards. Rows of cabernet sauvignon grape vines are terraced up the hill. 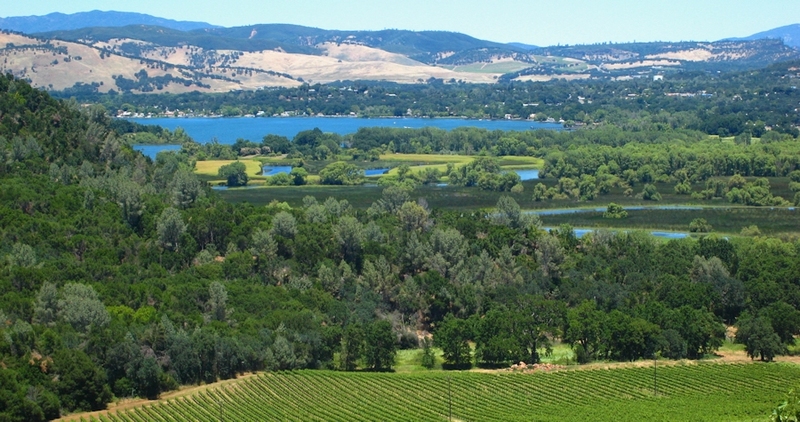 This area is part of the Red Hills Appellation, a vine region lying along the southwestern shores of Clear Lake at the base of Mount Konocti. The Red Hills soils are volcanic in origin, intensely red in color, rich in minerals and very well-drained – ideal and unique for growing premium wine grapes. 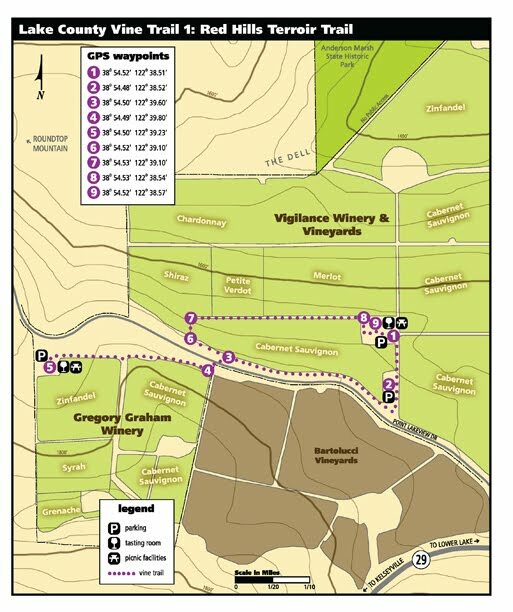 At 0.6 miles, you reach the Gregory Graham tasting room (5). Stop to reflect for a moment in their vineyard garden, or head inside to learn about their wines. Head back up the trail to the Point Lakeview Road crossing ( 3 & 4). Vines in the Red Hills are not impacted by coastal fog. Coupled with sunny warm days, afternoon breezes, and cool nights, the climate is ideal for producing high-quality grapes. After crossing the road, turn left toward the west. Continue along the trail until you come to an opening in the vine rows (6), and head down the hill. It is not unusual to see sheep roaming between the vines. Vigilance practices sustainable farming methods, using sheep to keep weeds down, while replenishing the soil with nutrients. Vigilant Marremma dogs protect the herds, watching for predators. At the bottom (7) turn right and continue along the pathway, enjoying the distant views of Clear Lake and Anderson Marsh. Large white dots among the wetlands are often egrets or American White Pelicans, enjoying the blissful sanctuary of Anderson Marsh. As you look across the hills, envision the past when the area surrounding the marsh was a thriving village for Pomo ancestors. The extended Anderson Marsh area contains archaeological sites over 10,000 years old, making them some of the oldest in California. Finally, turn (8) to Vigilance’s historic farmhouse tasting room (9), and enjoy the breathtaking views of Anderson Marsh. This trail can be started at either end (1) or (5). Please note that summer days may be very hot – bring water and sunshade. Please note: This trail is a private trail. Limited public use is granted only by permission of the property owners when their tasting rooms are open. The County of Lake and KRT are providing promotional assistance for the trail, but have not acquired an easement for public use, and thus do not accept any liability for trail construction, maintenance or use. A copy of the downloadable brochure in PDF format can be printed on 8.5 x 11.